This brief reports compares the performance of students who took Statistics 2000 (STA 2000) in a traditional lecture format with those who took the class in a hybrid format in the fall of 2013. Professor Linda Friedman of the Statistics Department taught both classes. In Fall 2013, two “double” sections – approximately 75 students each – of STA 2000 were taught by the same instructor (Linda Weiser Friedman), one as a traditional twice-a-week face-to-face class and one as a 50% hybrid class meeting only once per week for half the time. Students were not directed to register for any particular section of STA 2000 – indeed there were a large number of sections of this required course available throughout the hours of the day and the days of the week. Rather, interested students self-selected to enroll in the hybrid section. A comment displayed with the registration information of the hybrid section explained that approximately 50% of the learning would take place online and provided the instructor’s name and email address for further information. In addition to the same instructor, all exams were the same or equivalent for both classes and the same course materials were used in both. Blackboard was used extensively not only to post course information, but also for its discussion board, a common course blog, an archive of announcements and emails, and to link to course materials. Course materials included the textbook and the publisher’s homework manager as well as instructor’s course notes, narrated slideshow lectures, virtual handouts, homework assignments and solutions, reviews and practice problem sets. The instructor’s course materials are posted and maintained on a Google Site, open for viewing to all at: https://sites.google.com/site/proffriedmanstat/ These course materials have also been used in fully online courses such as the one taught at Baruch by Linda Friedman in Spring 2014 and by individual students, on their own or as part of a for-credit independent study course, who wish to study statistics for the first time, or to brush up on the subject in preparation for more advanced work. The Fall 2013 hybrid section of STA 2000 was approached as if it were the “recitation” portion of a lecture/recitation class. The students were required to study the “lecture” online before class. Class time was used to highlight important and/or difficult portions of the lecture, to work through problems and to answer student questions. 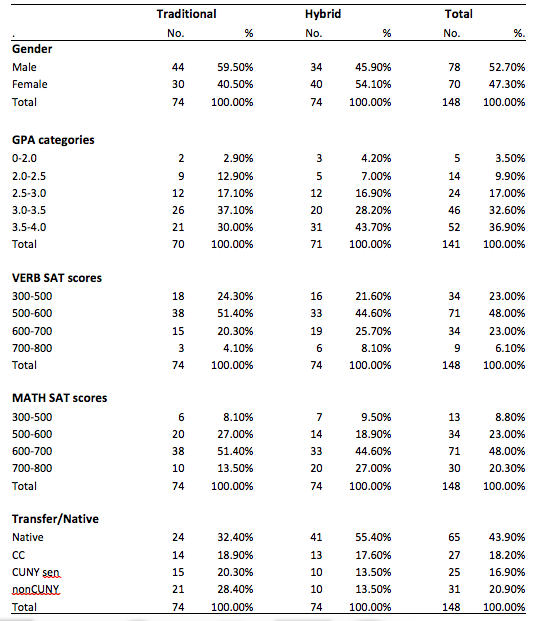 Table 2 shows the distribution of grades based on a 100 point scale. The hybrid students are more likely to have a grade of 80 or higher on both the average of the midterms and the final. This is also seen in Figures 1 and 2 which shows the histograms by format for the Midterms and the Final. As a more formal test, we regressed students’ grades on a dummy variable that is one if the student took the hybrid and zero otherwise. We then included a set of controls for gender, GPA, cumulative credits taken, along with the Math and Verbal SAT scores and transfer status. For students who were missing an SAT score we used the mean value of the known scores. 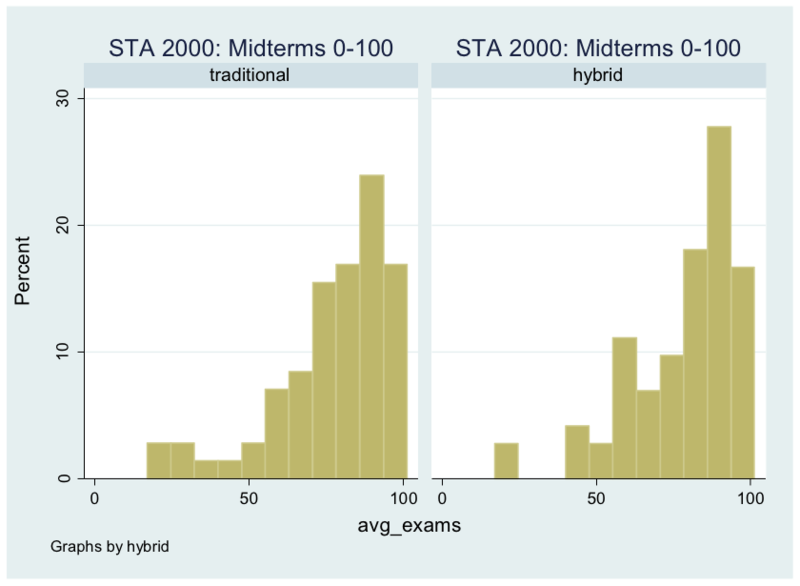 The unadjusted mean differences in scores are 1.88 and 5.76 higher among students in the hybrid class for the midterms and final exam, respectively. The standard errors, however, tend to be large suggesting that the analysis is underpowered. Nevertheless, adjusting for the covariates greatly reduces the magnitude of the coefficients. Indeed the coefficient on GPA is strongly associated with performance. A one-point increase in the GPA is associated with a 13 to 14 percentage point increase in the students’ test scores (p<.01). 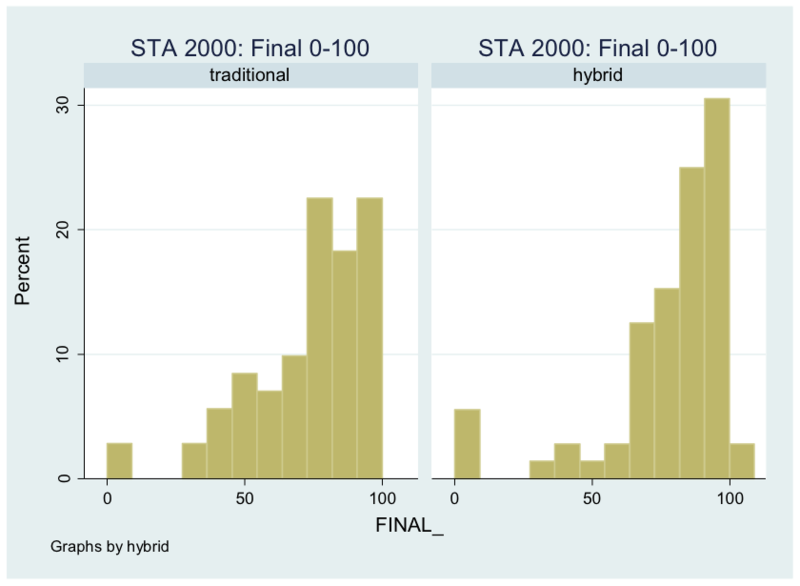 This brief report uncovered no statistically significant difference in student performance in a traditional versus a hybrid format of STA 3000. The strength of the analysis was that each class was taught by the same professor and that we were able to control for baseline differences in student academic performance prior to the class. However, the analysis would benefit from additional data from more sections taught by Professor Friedman and others. 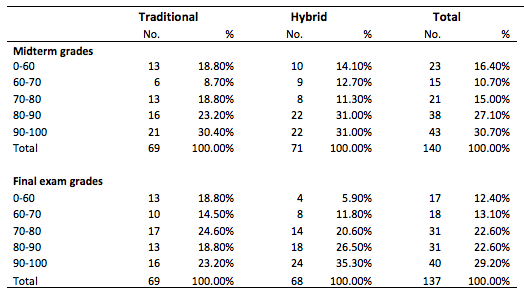 Despite this limitation, the preliminary conclusion is that students in the hybrid class did just as well as students in the traditional format. Is Taking Notes By Hand Better for Students? All CTL site content is licensed under a Creative Commons Attribution-NonCommercial-ShareAlike 4.0 International License.